The mean time between fail is an important metric where the failure rate of assets needs to be managed. It is the average time lapsed between breakdowns of a system. In other words, it is the average time the system or component functions between breakdowns. For mission critical or complex repairable assets such as generators, tankers or airplanes, mean time between fail becomes an important indicator of expected performance. It has also become a fundamental component in the design of safe systems and equipment. Mean time between fail does not take into account any scheduled maintenance such as recalibration, lubrications or preventive parts replacements. Whereas MTTR affects availability, mean time between fail affects availability and reliability. Mean time between fail is usually measured in hours. For accuracy, this measurement includes only operational time between failures and does not include repair times, assuming the item is repaired and begins functioning again. There are a number of factors that can influence mean time between fail, mainly human. Was the product applied in the correct way? Did the actions of the technician during a previous repair contribute to the failure? Mean time between fail figures are often used to project how likely a single unit is to fail within a certain period of time. Therefore, MTBF is a great way to quantify the reliability of a system or component. It refers to the average time the asset functions normally before it fails so it can be used to predict future performance. Organizations that provide automobile break down assistance, for example, factor in MTBF when determining pricing. The more likely the average automobile is to break down, the more they have to charge. 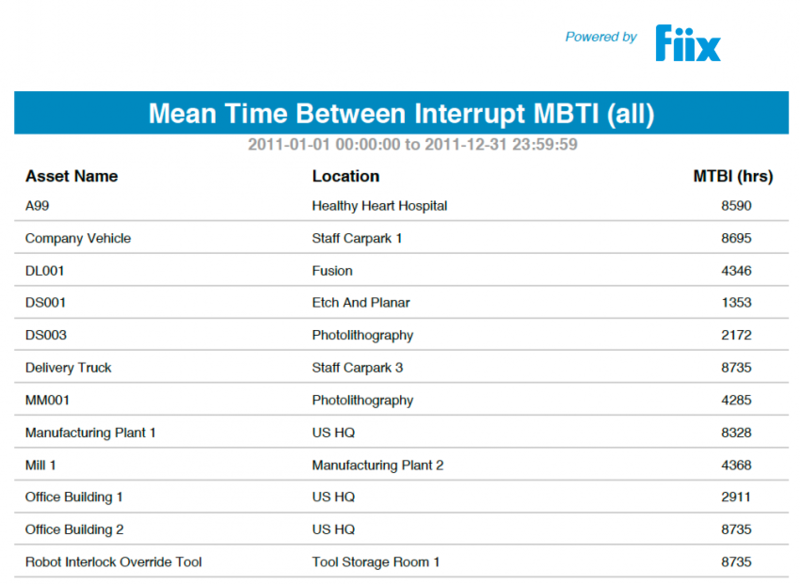 How do you measure MTBF with Fiix? Manufacturers may provide the predicted MTBF for system or component to indicate its expected reliability based on intensive testing. But is the manufacturers predicted MTBF relevant? The calculation could be based on data from newer generations and technologies while your organization runs an older model. For a more accurate representation of MTBF, we need an estimation based on actual field data. It is possible to pull MTBF for your particular assets data directly from Fiix. When an asset goes down for repair, simply select the reason that accurately describes the situation. 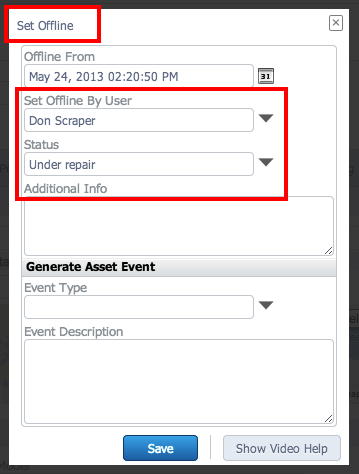 Reasons to set an asset offline can be configured in the lookup tables in the settings section. When the repair is complete, log the system back up to production. This online/offline data is then used to calculate MTBF. MTBF is also a important reliability metric and can influence the design of newer systems. Quality driven manufacturers track failure modes and defects so they can eliminate them from the design process going forward, improving MTBF over time.